The Rose CrystalView Pro Fiber Card CRV-SLDFMUDVI-IRK is a Digital USB Local KVM Multi Mode Fiber Extender Card with internal PSU. The CrystalView Pro fiber is the KVM extender of choice for businesses that need to extend and operate several computers, servers, or KVM switches from a great distance. The CRV-SLDFMUDVI-IRK makes this possible by the use of standard fiber optic cable. 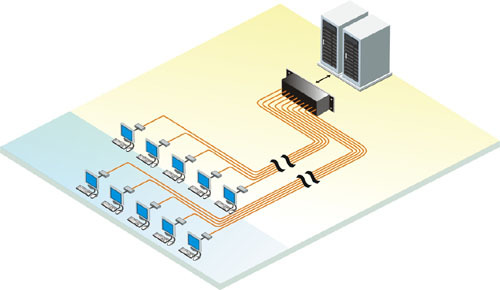 You can fully operate and control 10 computers or servers from as far away as 33,000 feet using 9-micron fiber cable.